1. Do you think the Queen sent the Earthmen specifically to fetch the children and Puddleglum or was it a general order to bring anyone who fell down to her? 2. Lewis describes the gnomes as being very different. Do you think this variety will be seen in the movie? Which gnome would you most like to see? 3. Jill and Eustace both are forced to face their fears. Jill has to crawl through the small tunnel and Eustace must stand on the edge of a cliff and fall off. Which experience is worse and why? 4. “That is old Father Time, who was once a King in Overland.” Could Father Time be the giant memorialized in the “under me” inscription? Oh yes, it was specifically directed at the children! I'm not saying there wasn't a general order to bring anyone who fell down to her at each available entry to her world. That does explain how so many previous champions had vanished over the years. Whoever survived crossing the terrain and adverse weather, and then escaped the giants, whether at Ettinsmoor or further on at Harfang, would fall victim to her and few would return as the watchword goes. However, LOTGK, herself, had also met the children near the Giant's bridge, when she directed them to Harfang. In the intervening time between the children's meeting her, and their arrival at Harfang, she had ample opportunity to return to her palace with the Black knight and issue new orders to the gnomes, to ensure that there were enough at that outlet to meet two children and a Marshwiggle. So I've no doubt such guards were reinforced in case the children did manage to escape Harfang. Or even if they didn't take the bait of hot baths, nice meals and comfortable beds. I don't see how even computer generation is going to manage the sort of variety and individuality that is implied in the book, to be able to be replicated in the movie. I think the directors will concentrate on the leading earthmen, such as the Warden and Mullugutherum, the ones with speaking parts. It is not how individual gnomes look that bothers me, but how they will sound. The difference between the FOTF audio and the BBC audio drama gnomes is that the FOTF gnomes sound so much more gravelly and darker, and I want that sort of thing for the movie. I'm inclined to think that Eustace's experience at the edge of the cliff was worse because the spectacle of instant death is what makes that experience so fearsome, and what makes Eustace's fears reasonable and normal. Crawling through the small tunnel in almost complete darkness is not as bad, despite its oppressiveness, because there is always the reassurance of hearing, touching and feeling one's way around, and there is no fear of falling. Besides, however afraid Jill was, at least she wasn't forced to face her fears alone. No, not necessarily. Old Father Time is a giantish personification of a concept, very like Mother Nature, herself. Besides, he lays sleeping. He will wake up at the end of Narnia. Unless one wants to argue that the present SC Giantish population are a deterioration from an earlier time. However, it was only a generation or so previously that in Narnia, itself, we had the Giant Wimbleweather at the second battle of Beruna, centuries after Giant Rumblebuffin helped reinforcements come to the rescue against the White Witch at the first battle of Beruna. There is one aspect of the chapter that I see as really important for the film. Jill has to face her own fears of dark, confined spaces, in this chapter, when crawling through narrow tunnels between those caves. Eustace tells her to think how he felt when falling over the cliff, but he does propose a solution to help her. He and Puddleglum will put her in the middle of the little group where she can feel a little safer by their presence. This is where Eustace is starting to think of the group as a whole. The main problem I see, is how to do an underground journey in sometimes pitch black, or in rather dim light. I do want to see the caverns of the reptile-like creatures and that of Father Time and do think these two caverns, and maybe one or two others, would leaven a very dark and visually uninteresting journey from the Ruined City to the underground beach, otherwise. There is also the lengthy voyage and how to depict it and portray the passage of time without taking up too much of the film's time. Fortunately in the book the children mostly slept, seated either side of Puddleglum. I could imagine that maybe, during that journey, more than the one ship mentioned in the book might pass their vessel, maybe one drawing alongside to share orders or news to the earthmen on board, and that during those stoppages food might be passed around which would allow for more interaction between the occupants of the boat. Or would the filmmakers just leave the children to sleep, with Puddleglum to argue with the crew? 3. I think it is very important that the experience of Eustace as a person who is afraid of heights, and the experience of Jill as claustrophobic, are equally bad. That creates a full circle effect. 5. I would like the glowing Underland forest to have an interesting visual effect. This would break the potential monotony of a journey through the dark. 1. Do you think the Queen sent the Earthmen specifically to fetch the children and Puddleglum or was it a general order to bring anyone who fell down to her?That's an excellent question. I'm inclined towards the latter, however, since I suspect the Queen likely was not aware that the travelers had left Harfang. Even the knight has not denied that the Queen likely knew exactly what was going to happen to them in Harfang, so I suspect she probably thought her troubles with them were over. Even if she had a contingency plan, I don't know how she could have known about their escape and sent guards to collect them in the time she had, unless the giants have some means of contacting her even when she's underground (since they clearly can't use the same passage down that the travelers did). I also suspect that, if she'd known the travelers had come and had ordered them brought to her, she would've been there to intercept them, instead of off attending to other business. 2. Lewis describes the gnomes as being very different. Do you think this variety will be seen in the movie? I really hope so. I don't want a generic army of minions - variety gives us individuals, which I think will make them seem more real. Also, given that we find out that they are, in fact, their own people enslaved by the witch, I think establishing the gnomes as their own entity will be vital to buying their rescue at the end. I also firmly believe that they need to make it clear that the gnomes are sad, and I'd like it to be clear that they're also spellbound. Jill's, I think. Eustace was caught almost immediately by Aslan's breath and blown to Narnia, and even though he got no explanation, I would imagine he would've felt the difference when he was being blown as opposed to falling. Jill does not have Aslan to help her through it this time and it's for a much longer period of time, while she's a captive of an unknown force. She has Puddleglum and Eustace to keep her company at least, but I still think hers is worse. That's a really fascinating idea. It could just as easily refer to a king like the knight describes, though the idea that there's more to the story that he doesn't know - or care to know - is certainly plausible. I also find it rather likely that, given how much else the LotGK lies to Rilian, it's possible that she made up the verse entirely to throw the children off, though I prefer Puddleglum's explanation that the writing was originally written as a boast, but Aslan allowed for the necessary writing to remain for the children. waggawerewolf27 wrote: No, not necessarily. Old Father Time is a giantish personification of a concept, very like Mother Nature, herself. In the past, I've kind of assumed that he became Father Time at some point, rather than having been born as the personification of time. I hadn't thought about it this way before. While the gnome army certainly comes off as intimidating, as I mentioned before, I don't want them to be an army of Stormtroopers. I really hope the movie maintains the sense that the book does, that it's not clear if the gnomes are evil or just defending their lands or... what. I prefer melancholy and a touch of suspense. Anhun, I really like the picture you included! It also makes sense, given that the book describes the foliage as glowing slightly, and it could be really cool if the movie makers run with that. Twig's wrote: 4. “That is old Father Time, who was once a King in Overland.” Could Father Time be the giant memorialized in the “under me” inscription? I was actually going to suggest this. It was something that occurred to me while listening through the audio book recently. It seemed very appropriate that they should have a ruined city and an ancient inscription to some long-forgotten giant king and then discover that giant king sleeping in the heart of the earth. While both are scary, Eustace's fear is much worse because he is forced to face it against his will and he does so alone. Jill knowingly went into the tunnel and she was with two others. 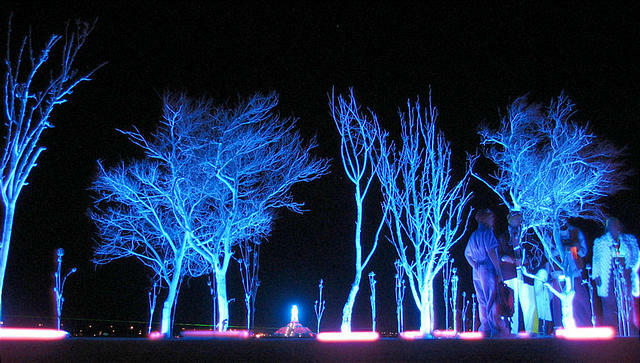 The glowing forest idea intrigues me! Hwinning wrote: 2. Lewis describes the gnomes as being very different. Do you think this variety will be seen in the movie? Which gnome would you most like to see? I should clarify that I meant from an audience's perspective, it should be clear that something is off, along the lines of subtle details that you can't put your finger on. Otherwise, I feel like the revelation that they were spellbound later comes off a little bit like a Deus ex Machina. But you're right, it should definitely be a surprise for the characters, "obviously" was the wrong word to use here. Then again, perhaps just making them sad and pitiable will be enough.. Sorry, I'm often writing these posts during breaks at work and I don't go back and edit like I should. 1. Do you think the Queen sent the Earthmen specifically to fetch the children and Puddleglum or was it a general order to bring anyone who fell down to her? I've always assumed it was a general order, otherwise she would not have been away from the palace. 2. Lewis describes the gnomes as being very different. Do you think this variety will be seen in the movie? Which gnome would you most like to see? One can hope! I think I'd be partial to the ones with the unicorn horn. 3. Jill and Eustace both are forced to face their fears. Jill has to crawl through the small tunnel and Eustace must stand on the edge of a cliff and fall off. Which experience is worse and why? We hear a lot more about Jill's. It's possible, too, that despite the fact that Eustace's worst fear comes true he can see fairly quickly that it's not going to end the way he feared--splat at the bottom. Whereas for Jill the darkness just goes on and on. What I found interesting this time around was the sense that being captured by the Earth Men was a far more dire situation than the giants intending to eat the travelers at the Autumn Feast--and that's counting Puddleglum's reassurance that they're finally following the signs. Is it just the fact that they are in literal darkness and nothing seems quite as bad when the sun is shining? Do you think the Queen sent the Earthmen specifically to fetch the children and Puddleglum or was it a general order to bring anyone who fell down to her? I think it was just stranded procedure. The Queen send them to Harfang to be lunch, so I doubt she was expecting them to escape. Jill and Eustace both are forced to face their fears. Jill has to crawl through the small tunnel and Eustace must stand on the edge of a cliff and fall off. Which experience is worse and why? As someone who is both scared of heights and a little claustrophobic it's hard to say, but I think Jill probably had it worse. Although the falling off a cliff must of been terrifying it happened so fast no one had time to think and Eustace was almost immediately saved by Aslan. Jill had to suffer more I think. I want the film to make the Gnomes as off putting in the film as they are in the book. Both in their varied appearance and their depressed attitude. I assumed it was a general order. Hmm, they might keep them similar for budgetary reasons. But it would be cool to get some diversity! I'm not afraid of heights, while I really don't like small spaces. Still, I think falling off a cliff might be more scary. I always thought that was the case!